It was, at the time, an eerie calm outside. It felt as if the wind had hit the pause button, though somehow you could still feel something moving through the air. My family lived in a single story home, which is rare for the Omaha area, and had very few options when rushing for the safe spot in the house during a tornado. Crushed and clamored in the hallway was certainly not our first choice for family interaction, but on Pease Drive, it was the safest. Reports were coming in with a tornado touching down about two miles west of our home, moving southeast. This was all more of an annoyance, really. Growing up in tornado alley, this was just part of the summer experience. By the time I was in high school, I slept through and completely missed the tornado sirens for a touchdown that occurred on my school route. At the time, though, this was intense. I was maybe seven or eight then and the electricity in the air was palpable. My father decided he wanted to take a look and see things for himself; I immediately decided I had to as well and opened my eyes to my first live look at nature’s wild beast. I, of course, felt like Indiana Jones jumping over a chasm; my inner manliness wanted out to stare danger in the face. My dad, on the other hand, was frustrated this storm forced him to stop working on his yard project out back. As a child, our eyes are usually closed even when we think we are staring danger in the face. That tornado did not pose a significant threat against me, even if it had turned more our way. With my parents making the decisions and advanced warning tools gaining momentum, there was only slight worry as to our fate. If things had gotten bad we could have taken the 30 second run over to our friends’ home with a basement; and even if we couldn’t get over there, our home was at the bottom of a hill and we were all tucked inside a hallway. Everything we could have done to protect ourselves was checked. At that point, all there was left to do was wait for the finger of God to move. Recent posts of mine have referred to a story of a particular storm in my life; one that included years of car trouble, job searching and city jumping. It has certainly presented itself like a storm of storms. I felt much like the Israelites must have while trapped between the Red Sea and Pharaoh’s army. 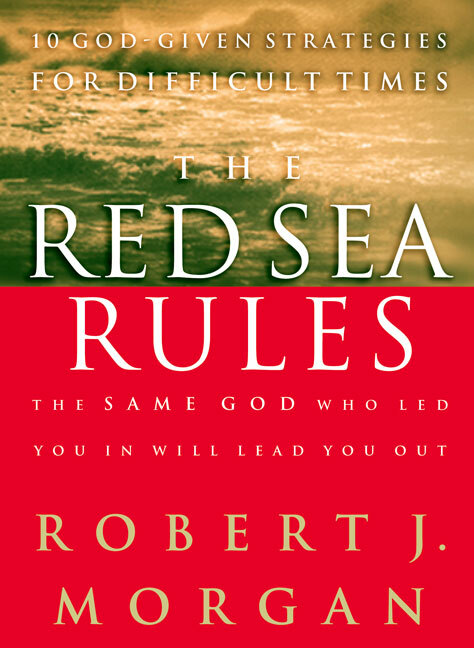 As I was seemingly nearing the end of the storm, my church pastor gave a copy of The Red Sea Rules by Robert Morgan. It was not a big or complicated publication, but it highlighted ten basic rules of faith that was portrayed through the Israelites’ flight from Egypt. I hope beyond explanation that this storm has passed. I am coming to realize, only now, the real purposes of this storm. Looking back over the last three or so years, there was not one moment where I was not under the protection of God. We never missed one bill payment, lost out on one meal, nor did we even have to significantly sacrifice much in the way of entertainment. We may have been dangling over the ledge, but there is no question there has been a rope tied around our waist. Of course, we could only be in the eye of the storm at this point and the cord could be cut – we could still go broke, lose our home, and go hungry; but God has made this abundantly clear: no matter what happens, He is still in control. That said, I choose to praise and thank Him for His presence in my life. Things may improve from here leading to a wonderfully prosperous time for Nita and I; they may push us off the cliff. Either way, I have learned that though I may bend, I won’t break. I trust in Him who provides. Here are some words from MercyMe’s song Move, that I feel mirrors our experience up to this point. Enjoy.